34 year old female with excess upper eyelid skin and hooding creating both cosmetic and visual field problems underwent an upper eyelid lift (upper blepharoplasty). Despite her young age, the patient felt that this made her look older and less awake. 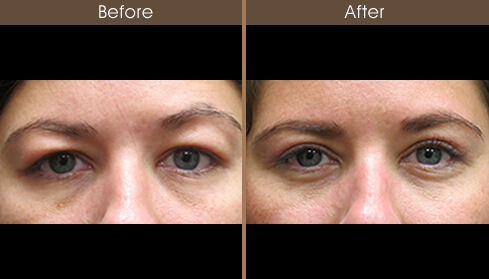 The procedure involved an upper eyelid lift with orbicularis muscle resection. Technique: upper eyelid lift with orbicularis muscle resection.